What’s Your End Game for Social Media? What’s your strategy when it comes to how you use social media? We’re all challenged with how we use our time and, at the same time, we’re challenged to use social media more. We’ve all reached a breaking point, and as a result we have to ask ourselves if we’re being smart. The end game of social media is to create one-to-one relationships. For the past year I’ve been saying, “Social media without social relationships is social stupidity!” Yet that is exactly what we do too often when we are using social media platforms. Before you spend any time on a social media site, you need to ask yourself if what you are about to do is going to help create one-to-one relationships with prospects or other advantages to your business? I raise this question because I’ve had far too many salespeople share with me that even after countless hours spent on social media sites, they have zero indication if it’s doing anything. We can’t eat “clicks” and “likes.” Last I checked, sales managers aren’t accepting “clicks” and “likes” as a way to make quota. If we want to be serious, we have to first realize social media sites are nothing more than a different type of telephone. We use the telephone to have one-to-one conversations, and that’s how we need to start viewing social media sites. The solution is not to pepper your prospects by sending them messages via social media that are nothing more than blatant sales messages. That’s the worst thing anyone can do, and yet there are too many people doing just that! What’s missing is the first word of social media, and that’s “social.” Before we engage with anyone, we must be social. The easiest step forward is to engage with people who post comments on items you post. It’s embarrassing to think we even have to say this, but it’s true – too many salespeople do not respond to comments left on their posts. I’m not going to imply the person who responds is your next great lead. No, but they might be just one step away from your next great lead. Engaging on social media is not just throwing stuff out there and walking away. Engaging means joining conversations and adding value. Is this a straight-line path to filling your sales pipeline? No, but it can become an additional source of leads for you to complement the other things you’re already doing. Remember, when you post on social media, you’re also creating your media profile, and don’t think for a moment a prospect is going to engage with you in any manner without first checking you out on the Internet. Before you spend any more time on social media, you need to ask yourself, “What are the best avenues I need to take to reach prospects and create leads?” Two further questions to ask: What types of information will prospects find valuable? and What social interests are prospects most willing to align with? 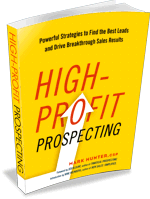 If you haven’t already, be sure to find more great prospecting tips in my new book, High-Profit Prospecting! You won’t regret it! PrevPreviousSales Motivation Video: What Will You Learn TODAY?